Kurlee Belle: Put some colored girls in the MoMa: You are a work of ART! Put some colored girls in the MoMa: You are a work of ART! If you haven't heard Kayne and Jay-z's "Watch the Throne" then you need to stop reading this post for a second....pull up iTunes and download it. This album has been on repeat since it came out in August (Yes! It's just that good). Although, I hold each and every track near and dear to my heart "That's My B$tch" is a fav. While listening to the genius lyricists Jay-Z, I couldn't help but think about the beauty of a natural black women. In "That's My B$tch" he says "I Mean Marilyn Monroe, she's quite nice. But why all the pretty icons always all white." I couldn't help but think of a time when straight hair was the standard of beauty. Back in the day, I would go to the salon just to get my edges touched up or pile on loads of Ampro Style gel just to get the slick effect. Nowadays, I cringe at the thought of straightening my luscious curls and rolled up edges just come with the territory. This new found beauty of being natural has truly made me look at myself in a different light. Whether I'm at Starbucks or walking the dog, I seem to be surrounded by beautiful women of color rocking their natural hair with confidence. I see the 'FroRocker' who wears her afro with pride. She is a no non sense kind of girl that knows where she is going and confident that she will get there. Then there is the ultra 'Sophisticated Chic' with her two strand twists. She is versatile in every way. Like a chameleon she can be Michelle Obama by day and Janet Jackson by night. The 'Lisa Bonet/Erykah Badu' type, is calm, cool and poetic. She is every guy's fantasy with her long locs of love and save the world attitude. Each and every one of these women are beautiful to me, because they know who they are and aren't afraid to show it. In a world where beauty is defined by skin tone and hair texture. Team natural has started a Revolution. A revolution where our little girls can be proud of their nappy head and chocolate brown skin. 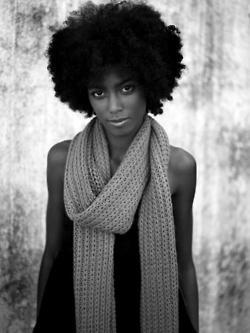 Even fashion magazines have started to embrace the natural hair trend with singer/models like Esperanza Spalding, Solange and Corinne Bailey Rae being featured in main stream magazines like the New York Times and InStyle. Companies such as Gap and Target have also started to feature natural hair models in their ads. Showing that the world is starting to embrace black as beautiful. Jay-z goes on to say "Put some colored girls in the MoMa. Half these broads ain't got nothing on Willona." If no one ever tells you, know that you are a work of art. Beautifully and wonderfully made. With all your curves, shades of brown, kinks and waves. There is nothing more beautiful than truly accepting YOU for who YOU are. Stay Natural and Be Fly doing it. Winter Shorts Trend: A Do or Dud? WORLD NATURAL HAIR SHOW 5 MONTHS AWAY!